It is finally starting to cool down here in Tennessee, and I am so excited for soups and stews. In fact, when I was at homeschool group yesterday I couldn’t stop thinking about making soup for dinner last night. 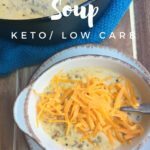 As I was perusing Pinterest, I found several soup recipes that looked amazing, but none of them were keto friendly. However, the great thing about following a keto/low carb lifestyle is that many recipes can be easily tweaked. So, I started thinking about how I could change up a Cheeseburger Soup recipe so that it would be low in carbs and high in fat and was so pleased with the outcome. I added riced cauliflower instead of potatoes, and it was truly better than I expected. Normally, I’m not a huge fan of cauliflower. I don’t think cauliflower mashed potatoes are good and in my opinion, cauliflower should never ever be in pizza. However, when you saute it in butter and add it to soup with a yummy ground beef/cheesy base the flavors merge all together, and the result is absolutely delicious. This soup is very filling, and it made enough for leftovers this week for lunch as well. Cook riced cauliflower in microwave according to package directions. In a large saucepan saute onion and minced garlic in one tablespoon of butter until translucent. Add the other 2 tablespoons of butter and the riced cauliflower to the onion/garlic mixture and saute for 5 minutes stirring so that it doesn't stick. Add ground beef, chicken broth, heavy whipping cream, and spices. Bring soup mixture to a boil, reduce heat to low and simmer for 20 minutes. Add cheddar cheese a cup at a time, stirring with a whisk so that it melts evenly. Once the cheese is melted, add the Xanthan Gum so that the soup thickens. Cover and simmer for 5 minutes to allow the soup to thicken. Check out all of my Keto Recipes in my Keto Recipe Index. This soup looks so amazing. I am going to try this over the weekend. I see this recipe makes 8 servings but what is the serving size? A cup or 1/2 cup? Thanks so much for your wonderful recipes. I didn’t measure the exact size, I just counted the number of servings I dished out. You are so welcome. Glad you are enjoying them. Wha can you substitute for xanthem gum if you dont have it? Any suggestions for subbing something else for chicken broth? My husband is allergic to poultry. Could we do a veggie or beef? I think either would work. Can this be made without the Xanthum gum? It can, but the soup would be very thin and runny. I’m going to try this with coconut cream instead of whipping cream and nutritional yeast instead of the cheese. Great! Sounds like a great idea. If you make it in a crock pot, do you not add the Xanthum gum until the end, just before serving? I would wait until about 30 minutes before serving. This is amazing!!! I’m just wondering if you would freeze this? Also my soup turned out thick so I didn’t have to add the xantham gum. Not sure why but it was delicious so it didn’t matter. I haven’t tried freezing so I can’t say for sure. Glad you enjoyed it. I could not find xantham gun at my local grocery. Could you recommend using something else? Would it be okay just to skip it? You could skip it if you’d like. It won’t change the taste but the consistency will be thinner. I’m going to try a ground turkey version! How many cups in a serving, and is there anything i can do to cut the fat down? I did not measure exactly I just divided into equal servings. It is up to you if you’d like to cut the fat, however I follow a Keto Diet and it is high fat. You could perhaps reduce the cheese. do you cook the meet before prior? Yes, I do cook the meat beforehand. Great idea to use the riced cauliflower instead of any potatoes. 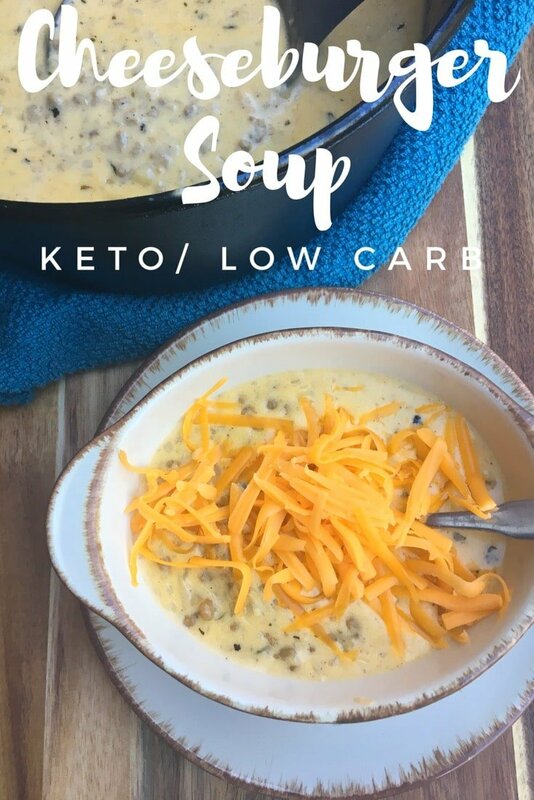 I saw a ‘low fat’ version of a cheeseburger soup on another site and thought, nah this can be made keto! Google search brought me here. Im making this tonight. Im not super strict on my keto, so I’ll prolly use a few T of flour to thicken since I dont have xantham gum. btw, Im checking out the biscuit recipe next, Ive been craving some biscuit and gravy! So glad you found this version! I hope you enjoyed it. I’m planning to try broccoli instead of cauliflower ? Why do you use freshly grated cheese instead of packaged? The packaged cheese contains ingredients to keep it from clumping that add carbs. Yay! I hope you enjoy it. I made this today, and I used cheddar and Monterey Jack cheese mixed. I also put 2lbs of hamburger because my hubby likes his soup to be like a stew and with no crackers I wanted it to be nice and thick. It was fabulous. Fantastic! I’m so glad you both loved it. I made this tonight and my family ate it right up! Made this along with Low carb Cheesy Breadsticks and was the perfect combination. I didn’t have the cauliflower but I did have a veggie California medley aka (carrots, broccoli, cauliflower) it was soooo good. So glad your family loved it! The soup is fabulous, I made it yesterday for dinner, had it today for lunch! YummmY Good. Today I put about a tablespoon of sour cream, and butter, along with my cheddar cheese sprinkle on top! WOW…thanks so much for your dedication to KETO cooking! Kasey! Just made this and my family loved it!! Including my anti-cauliflower eating 15 year old! She suggested me add bacon bits – the natural ones from Oscar Mayer…. it was the bomb!!! Bacon Cheeseburger Soup!! And she added American cheese on the top! Thank you so much for the keto meal ideas. You are helping me so much in my keto journey!!! Happy New Year!!! God’s blessings to you and your family!!! Awe great to hear Donita! Thanks! This is excellent. My husband and i feel you could rename it Cheesy Hamburger “Rice” soup. I’ll be making this again and again! So glad you both loved it!